It's been a slow, but steady summer for me. 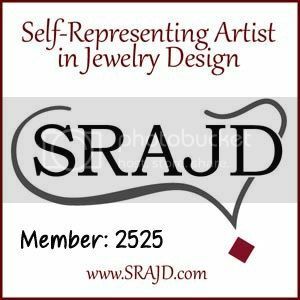 I've been working on cleaning up the code on my website, doing a lot of sketching, and learning about making jewelry through trial and error. I've had a number of custom orders, but spent the majority of my time reading forums, tutorials and learning, learning, learning by making a number of mistakes. Most of what I worked on hit the trash can. But here are a few of my favorite things from this summer. 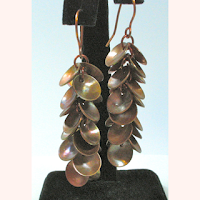 I call these Copper Domed Petal Earrings and I had a blast making these though they took awhile. Yes, I could have bought the blanks pre-made but this is me working full fabrication, forged from start to finish. With a number of discs thrown into the recycle pile. (sigh) Still, now that I know what I did wrong, I’m ready to make some more of these... in different sizes? maybe even mixing copper and silver? Stamped? Patina’d? Suggestions? 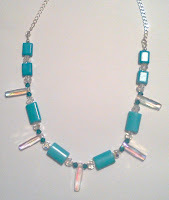 I wanted something turquoise to wear and these Swarovski crystal columns have been sitting in my stash for way too long. Feeling lonely. Unwanted. Unloved. Poor Swaros. This is really stunning and looks so much better in person than in the photo. his necklace looks so much better than I can photograph. 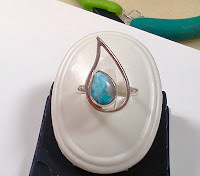 I used beautiful, puffed rectangle and oval rectangle beads of dyed, stabilized turquoise, in a vibrant blue very close to the color of real Sleeping Beauty Turquoise, but at a much lower price. The beads together with stunning Swarovski Crystal AB columns, rounds and Indicolite bicones connect to a sterling silver chain with lobster claw clasp and create a simple, yet elegant necklace for an evening out. By far my favorite, and hardest project, it took me several days to finish this one. I have no idea what the stone is as it came in a lot of mixed cabs. It's a beautiful blue, with white spaces and tan colored veins. I wanted to do something to complement it's petite pear shape so after forming the bezel, I made a leaf out of Argentium wire. 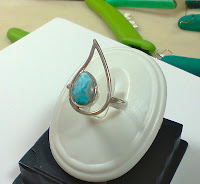 I then soldered the bezel to the inside of the leaf and used sterling silver half round from my stock to create the shank. I did need some advice how to properly solder the shank to the leaf so asked my resources over at Orchid. One reason it took so long. 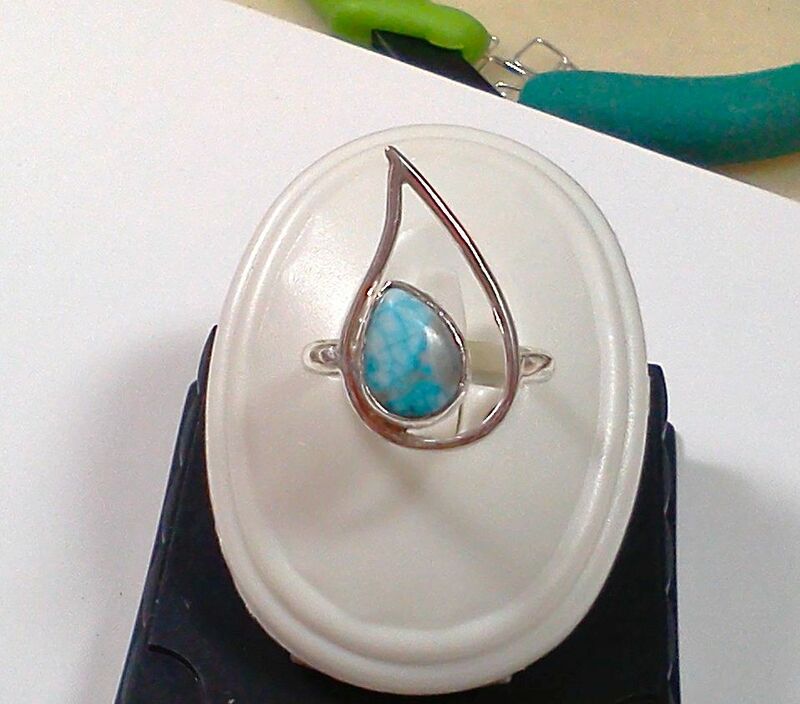 But it came out great and now I’m working on a series of rings, bracelets, earrings and necklaces to complement this one. So for me, it's been an interesting summer. Slow, but a lot of fun. I'm still working on the website, cleaning up code, changing over to my new logo, fixing it up and trying to make it better. But the time I spend learning and writing code for the pages, takes up the time I'd rather be in the studio, making mistakes and also making some beautiful jewelry.